Now that Travis is home I've been a little out of the loop of adding new blog posts. So, I am finally getting back to it today. Since I missed Tasty Tuesday, I thought I would combine Tasty Tuesday with Temptation Thursday. 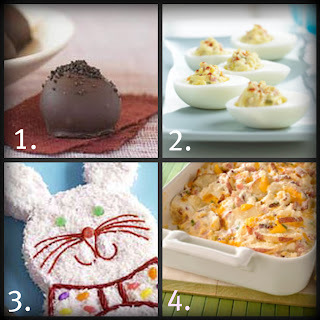 Here are many yummy items that would be delicious on Easter Sunday. They really make me want to try to make them for Sunday. Click on the name of each below for the recipe. All of these items came from Kraft Foods website. That Easy Oreo Truffle looks delicious! Thanks for sharing!